Now that the second trailer for The Defenders has dropped and we are less than a month away from the show airing on Netflix (August 18! ), let’s do a deep dive into the history of the group. No, not the Defenders — most of the characters on the show have absolutely nothing to do with that team (aside from Luke Cage, who was a reserve member of the Defenders). No, I’m talking about the Marvel Knights, the imprint that revitalized Daredevil and the Punisher and so much more. Oh god, the Liefeld, it BURNS. But first, let’s talk about Heroes Reborn. In 1996, in an attempt to gain the new readership that Image was getting, Marvel outsourced four of their properties (Iron Man, Captain America, Fantastic Four, and the Avengers) to two of Image’s studios, WildStorm Productions and Extreme Studios (run by Jim Lee and Rob Liefeld respectively). WildStorm would handle Fantastic Four and Iron Man and Extreme would handle Captain America and The Avengers. Despite the changes being loathed by many, the Heroes Reborn lineup was actually pretty successful and once a year had passed, Marvel asked that the contract be renewed, on the condition that Jim Lee draw one of the books. (Captain America and The Avengers had already been moved from Extreme to WildStorm due to Rob Liefeld being extremely late as usual.) Lee, however, didn’t want to do that, so passed on the contract and the books returned back to Marvel, where they actually enjoyed another surge in sales, as Mark Waid took over Captain America again and Kurt Busiek enjoyed a critically acclaimed run on The Avengers. Even though it hadn’t been the plan, when the books returned, fans were happy the experiment was over. If only the TV show could be as awesome. So, in November of 1998, the Marvel Knights imprint was launched with four books: Black Panther by Christopher Priest and Mark Texeira, Daredevil by Kevin Smith and Joe Quesada, Inhumans by Paul Jenkins and Jae Lee, and The Punisher by Tom Sniegoski, Christopher Golden, and Bernie Wrightston. Black Panther became known for its twisty plotlines and intricate characterization, Daredevil for it’s dynamic art and brooding noir storylines, and Inhumans for being, well, weird and brilliant (even if it was only a 12-issue mini-series, it still won an Eisner). The Punisher, on the other hand, tried to make Frank Castle into a supernatural avenger which...didn’t work out so well. So that Punisher series was cancelled and relaunched again, this time with Garth Ennis and Steve Dillon at the helm, which led to a long and illustrious run for both of them. Art by J. G. Jones and your dreams. In any case, the Marvel Knights imprint was known for experimenting in style and tone and getting more indie comics writers and artists, rather than the older, more traditional Marvel writers and artists. This allowed Marvel Knights to be seen as older and more mature — generally, Marvel Knights was to Marvel as Vertigo was to DC Comics, the home to more mature and adult-themed books, a lot of them mini-series that experimented with the genre itself (like The Sentry by Paul Jenkins, Marvel Boy and Fantastic Four 1 2 3 4 by Grant Morrison, or Jeph Loeb and Tim Sale’s Color series, Spider-Man: Blue, Daredevil: Yellow, and Hulk: Gray). Focus was on characterization and less on continuity. In fact, the Marvel Knights imprint became so popular among readers that two years after it was established, Joe Quesada was named editor-in-chief of Marvel Comics. Once Quesada was named EIC, however, he instituted policies that basically made the entire line of Marvel Comics into Marvel Knights — looser continuity, greater focus on characterization, more experimentation with form and genre, and a bigger emphasis on decompression, which allowed Marvel to package and sell trade paperbacks, for which there was beginning to be a huge market. Which basically made the Marvel Knights line, well, obsolete. It stuck around, but the more adult-themed comics were now being published by Marvel MAX. The first Marvel MAX book, in fact, was Alias by Brian Michael Bendis and Michael Gaydos. Bendis has been an indie writer, having written crime and noir comics like Fire, A.K.A. Goldfish, Jinx, and Torso for Caliber Comics in the mid-90s. On the recommendation of David Mack, who was doing the covers for Daredevil, Bendis became a fill-in writer for the book and eventually took it over. In 2000, he was hired to write Ultimate Spider-Man and then a year later, Alias, which combined the crime and noir comics he had started out writing with the superheroes comics he had done currently. Marvel Knights continued chugging along, putting out various mini-series, some of which were highly acclaimed (like X-Men Magneto: Testament by Greg Pak and Carmine Di Giandomenico and Marvel 1602 by Neil Gaiman and Andy Kubert), but many of which came and went without notice. In 2013, the Marvel Knights imprint was finally closed. Not one of the better received books. But what about the titular “Marvel Knights” team? Was it ever actually a team at all? Well...kind of. The Marvel Knights imprint did publish a book called Marvel Knights in which Daredevil forms a team made up of Black Widow, Shang-Chi, and Dagger in order to capture the Punisher. But this team was never actually named “the Marvel Knights.” In fact, they had no name — in one of Nick Fury’s secret files, they are referred to as “Daredevil’s Unnamed Super-Hero Team.” The team was eventually joined by Moon Knight and Luke Cage, too, so it at least had two of the four Defenders of the Netflix show in it. The Netflix team is really more of a mixture of Marvel Knights and Heroes for Hire, a group started by Luke Cage and Danny Rand (Iron Fist was a book, ironically, never published through Marvel Knights or MAX). Plus Jessica Jones, who, really, has never been a part of any team (aside from participating in some Avengers fights if she was near when one broke out). 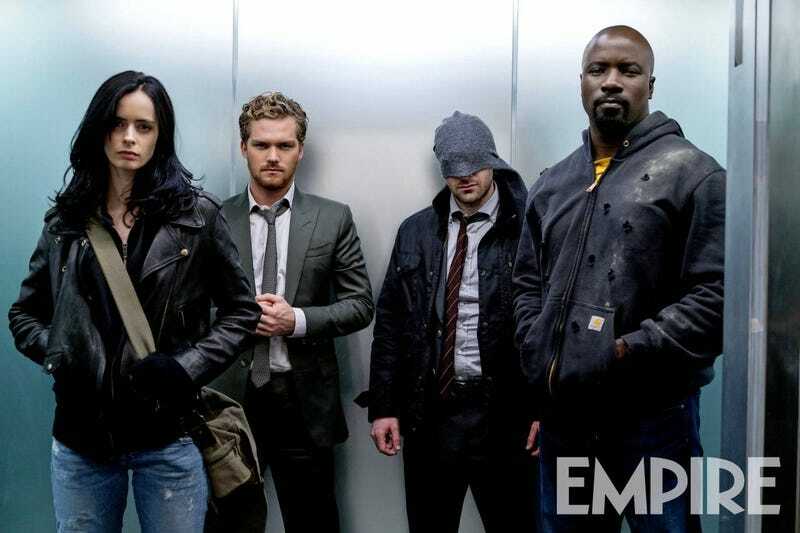 So putting Daredevil, Iron Fist, Luke Cage, and Jessica Jones together is basically making a team out of characters who have never been in a team together before. Kind of like the original Defenders. Currently, Marvel is putting out a Defenders book with the same lineup as the show. It’s written by Brian Michael Bendis, with art by David Marquez and it looks to be very interesting — since some of Bendis’s best work was writing for Daredevil and Jessica Jones, this is very much in his wheelhouse. I can’t help, however, but want the book to have a Marvel Knights logo on it, just as a reminder of what was and a nod to what could be.